His parents’ passion and love for food were introduced to him at an early age. His mom, being a housewife, was always able to delight her family with home cooked meals. 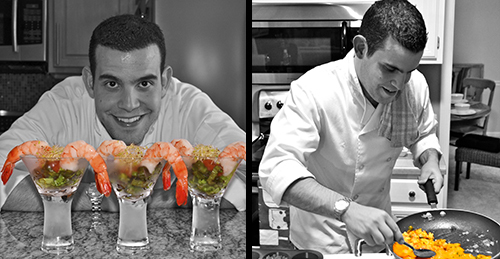 During this period of time, Gustavo showed a special interest in the preparation of food. After graduating high school, he moved to West Lafayette, Indiana to attend Purdue University where he earned a Bachelor in Economics and met his wife, Katy. During his time at Purdue he was able to put into practice everything he learned in the kitchen during his childhood. This resulted into a lot of hours experimenting with different flavors and evolving into what he is now. If he had to explain the type of food he makes, he would describe it as eclectic cuisine with Latin, Asian and Italian influences. His dishes are well planned and presented with great attention to detail. He makes sure that all his creations are well balanced in a way that pleases the most demanding palate. He currently works in finance and enjoys cooking for friends and family during the weekends. His wife, being his biggest supporter, encouraged him to participate in the 2013 Indiana’s Hottest Kitchen Entrepreneur Challenge. He won the competition with a Dominican inspired dish that wowed the judges. This is when Perrotta’s Kitchen Supper Club was born.